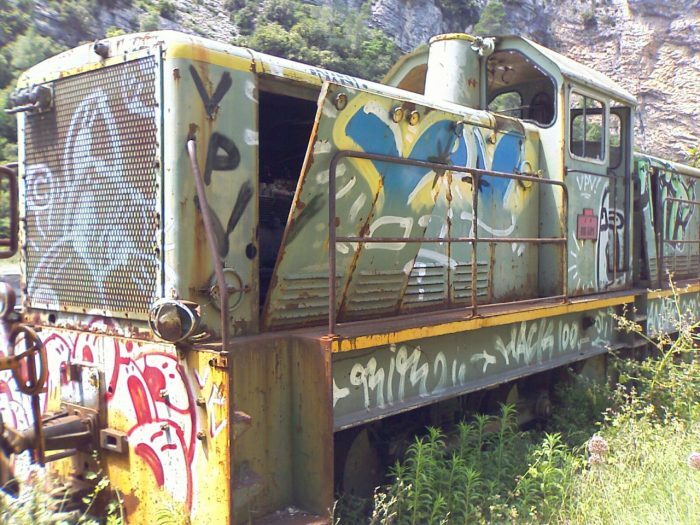 The use of steam on the Nice to Digne line was gradually abandonned. Increasingly, the travelling public became dissatisfied with steam haulage and the economics began to turn in favour of the combustion engine. The ease of use of diesel power worked in its favour, as did the rapid acceleration possible which resulted is significant reductions in journey times. Initially, diesel traction was trialed on the shorter journeys. One of the earliest diesel units to be employed towards the end of steam was CP51 which first started work in 1948. 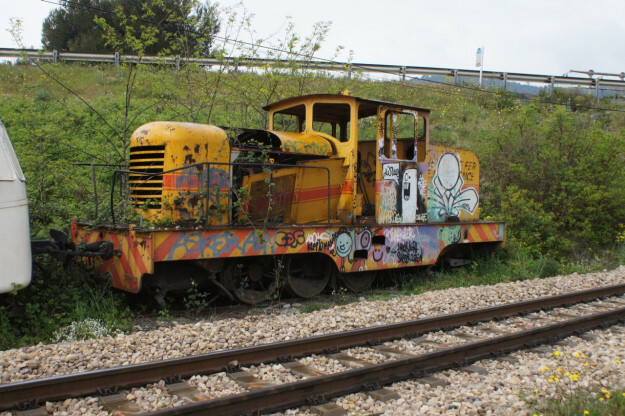 There is an older locomotive at work on the line, BA11, but this was not brought to the line until 1988 by the GECP. 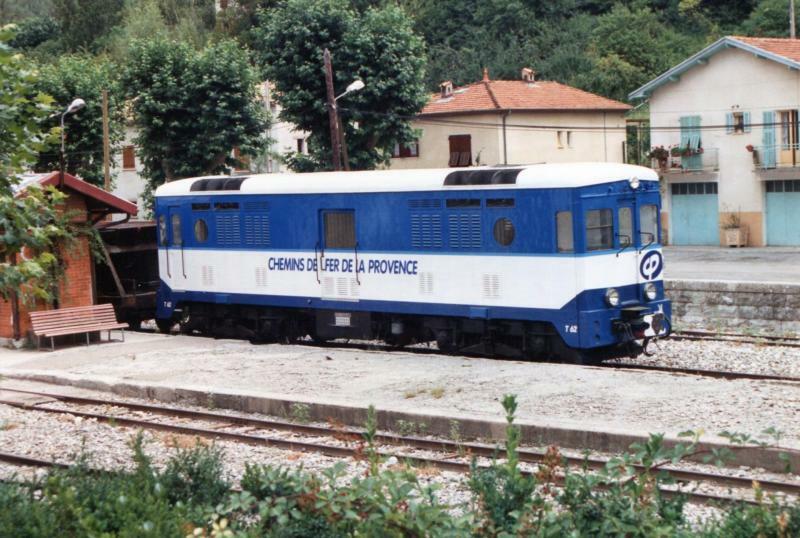 CP51 was the first of a number of diesel traction units which ultimately ran alongside a range of Railcars (Autorails) on the Nice to Digne line. It performed a series of differnt duties on the line over the years. 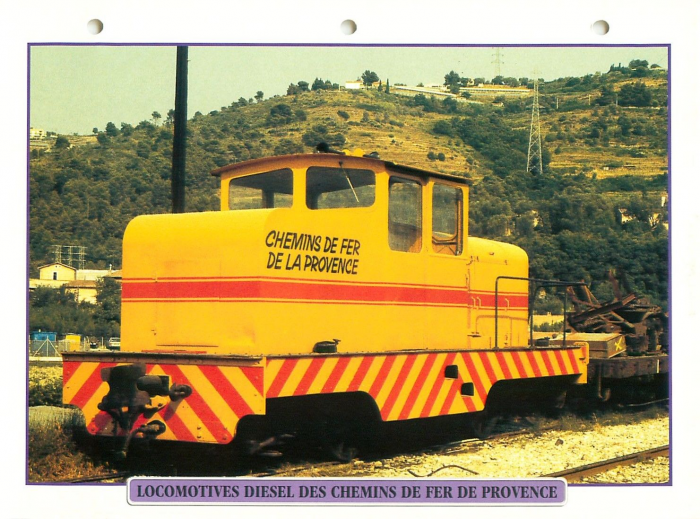 One important role was the movement of transfer stock from the Chemins de Fer du Sud to the SNCF and vice-versa. 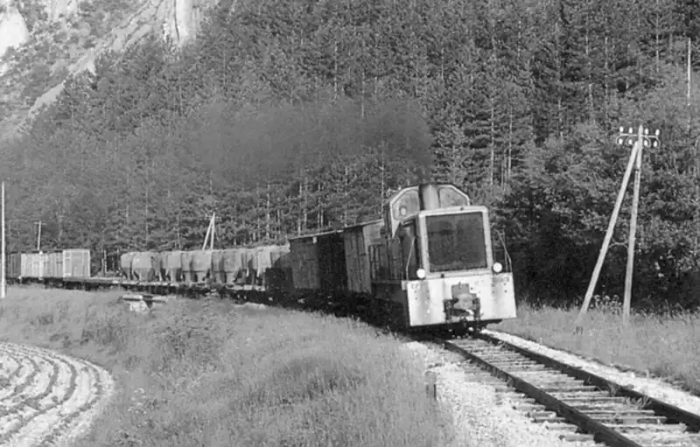 BA11 was one of 4 diesel 0-6-0 shunters (locotracteurs) in use on the Chemin de Fer du Blanc-Argent. Of those four locomotives, No. 12 is now on the Chemin de Fer de la Baie de Somme, Nos. 13 and 14 are still on the Chemin de Fer du Blanc-Argent. 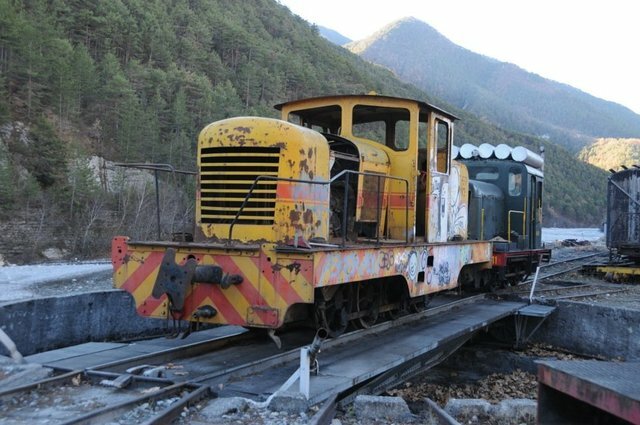 BA11 is the oldest diesel locotracteur (shunter) on the Nice to Digne line and it is still operational. Before arriving at the Chemin de Fer du Blanc-Argens these locos were in use by the Compagnie des Chemins de Fer Departmentaux (C.F.D.) on their Nord d’Indre et Loire network. BB401 was built in 1962  by the C.F.D. it was a diesel-hydraulic locomotive. 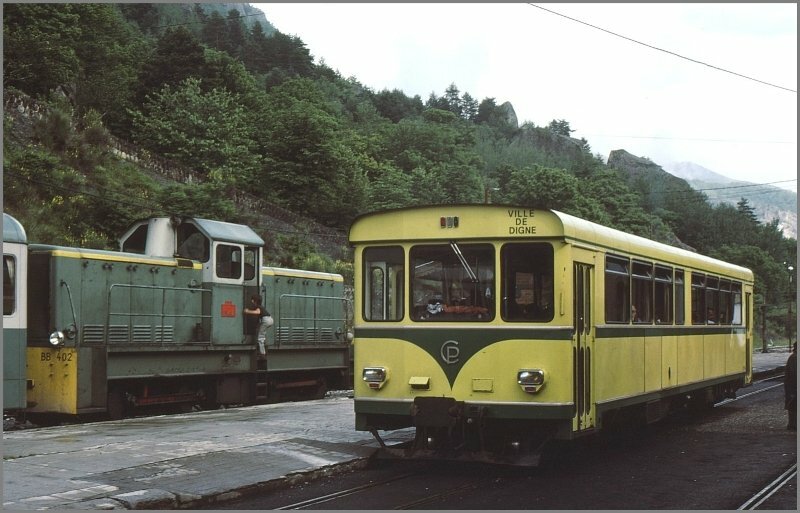 In the 1930s Brissonneau-et-Lotz manufactured motor vehicles (autorails/railcars) for narrow-gauge lines which were equipped with electric transmissions, for example, the railcars delivered in 1934 to the Chemins de Fer d’Anjou . 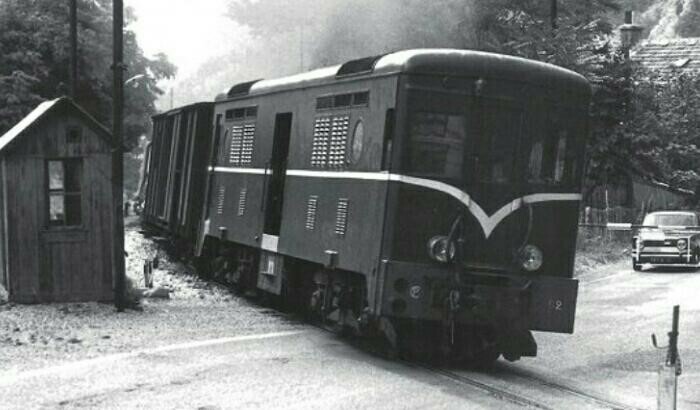 These railcars were seen as a loss-leader by the company and were provided at well-below market price. This allow Brissonneau-et-Lotz to undertake evaluations of the locomotives in service. 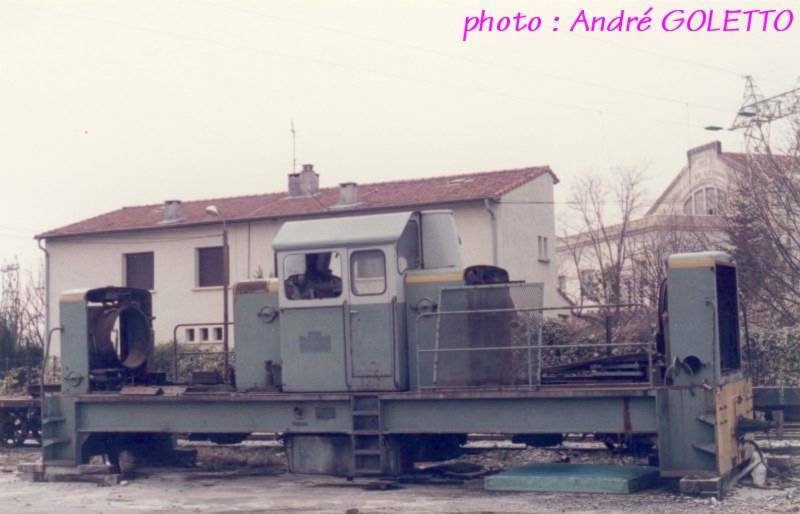 Building this small locomotive (shown in the adjacent image) paved the way for Brissonneau-et-Lotz’s involvement in the manufacture of diesel-electric locomotives. 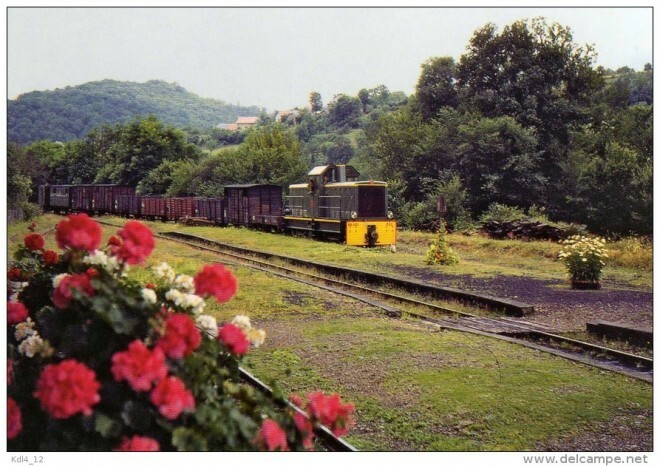 In November 1936, two Bo-Bo diesel-electric locomotives were ordered from Brissonneau-et-Lotz for the coastal line (Le Macaron). 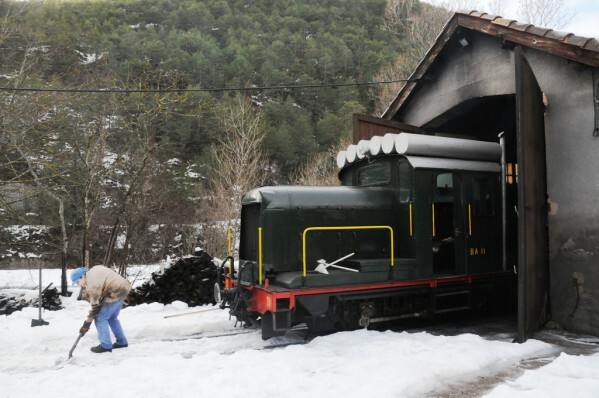 They arrived in 1938, the locos were equipped with two Berliet 150hp engines and were numbered T1 and T2. 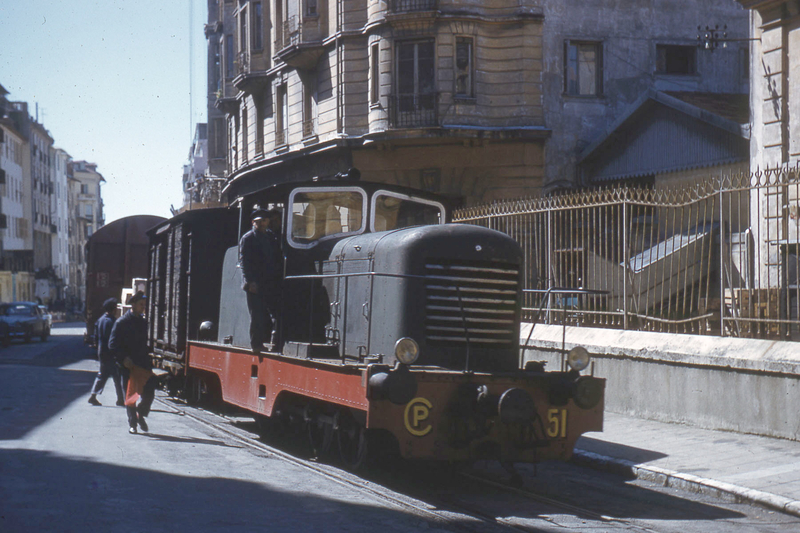 Those locomotives were sold into Spain with the closure of Le Macaron. 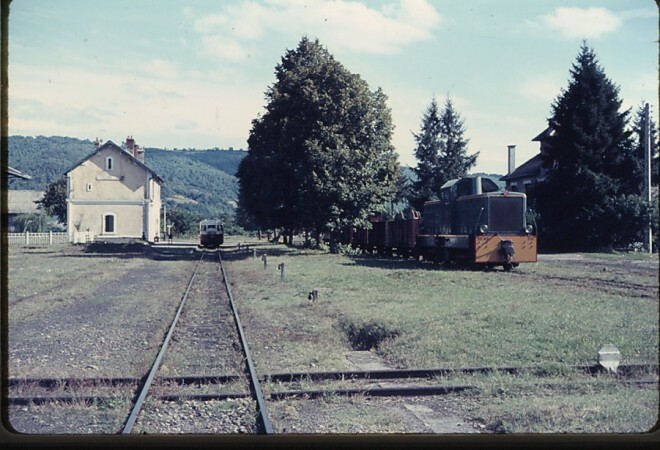 As a result of providing these two locos Brissonneau-et-Lotz were contracted to provide two locomotives for the Malagasy network, then four for the Reunion network (these had 160hp Saurer engines). It appears that cost reductions were partially achieved by a sharing of design costs between Renault, which was supplying the overseas market in the 1950s and Brissonneau-et-Lotz, who were supplying the domestic market. 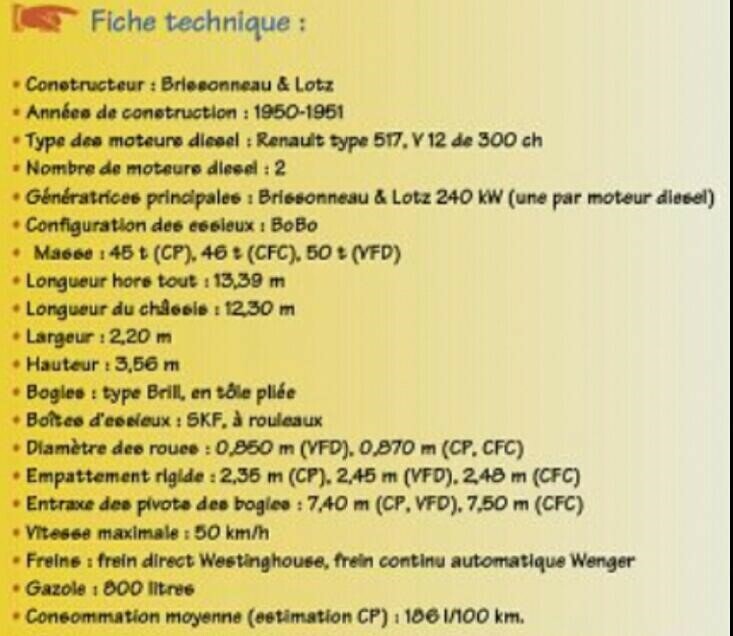 Although Renault used hydro-mechanical transmissions, the parallels between the Renault locomotives intended for overseas and the Brissonneau-et-Lotz diesel-electric vehicles designed according to the specifications of the UVF are obvious. 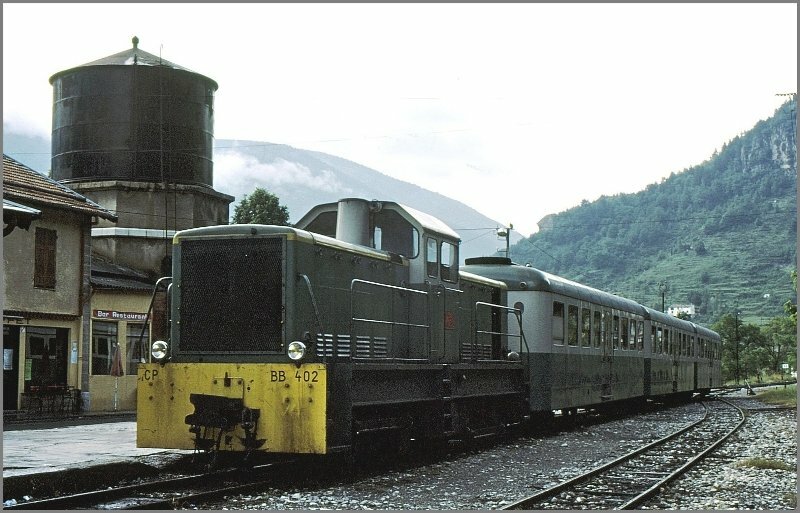 Both series of locomotives used Renault diesel engines, both used two diesel engines in order to attain the necessary pulling power. The four engines of the VFD were designated T1 to T4 and received there between August 1950 and January 1951. They served there until just before the Winter Olympic Games of 1968. 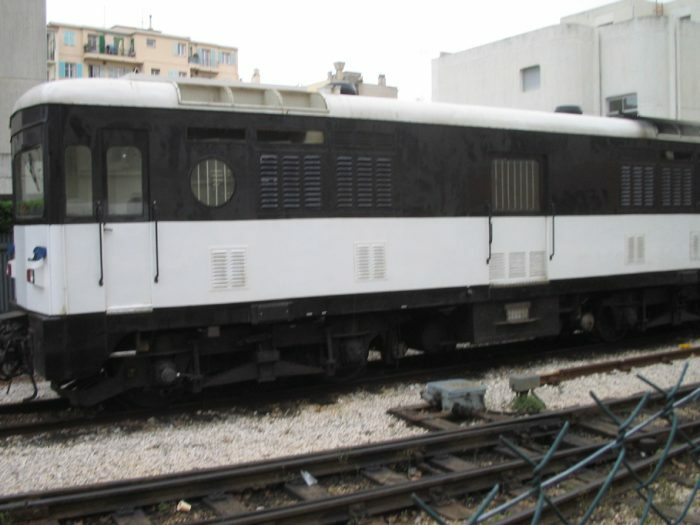 T63 stabled at Nice, resplendent in its brown and cream livery. © M. Fontaine. 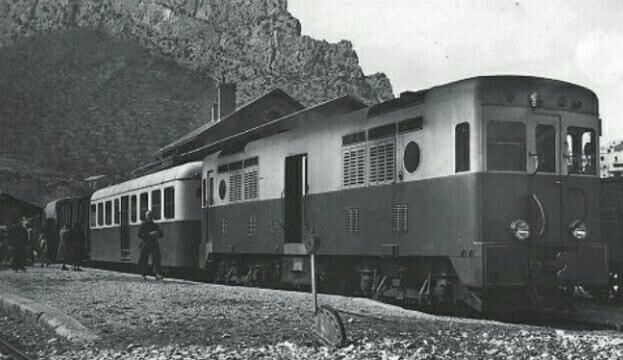 When originally ordered, T61 to T64 were intended for passenger service alongside the Renault ABH railcars on the Nice to Digne-les-Bains line. The technical spec. was downgraded to limit cost overruns, their role was limited to heading goods trains. T61, T62, T63, and T64 arrived in 1951. 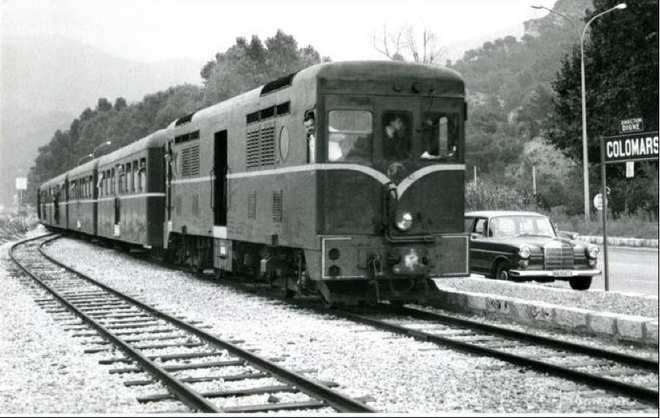 As we have already noted T64 left the network for Corsica in 1963, T65 was added to the roster of the Chemins de Fer de Provence in 1964. 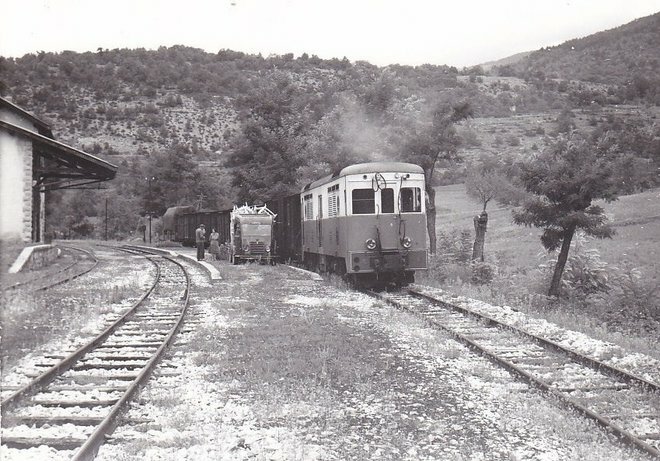 The closure of the line to Meyrargues meant that the network had more Renault ABH autorails available for the Nice-Digne service than originally expected and the reduced spec. of the tracteurs created no significant problems. 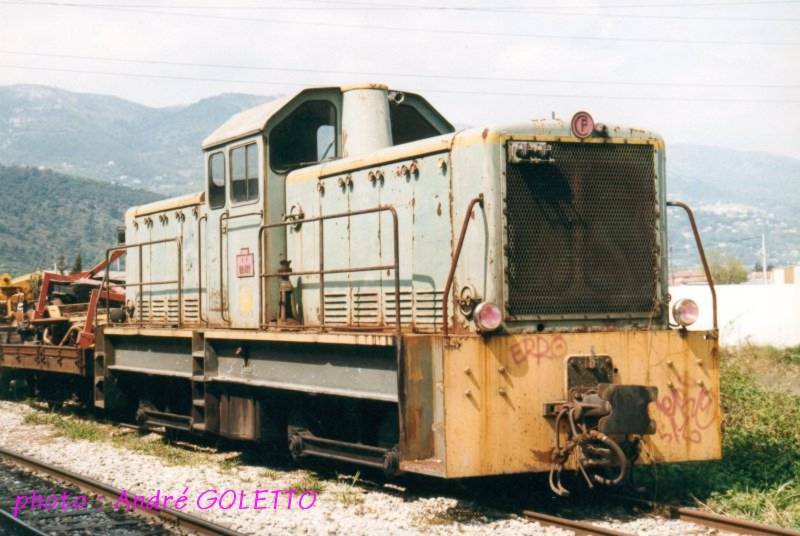 By January 1974 the condition of the locos meant that both T63 and T61 had to be cset aside and cannibalised in favour of T62, the only machine of the series kept in active by the Chemins de Fer de Provence. 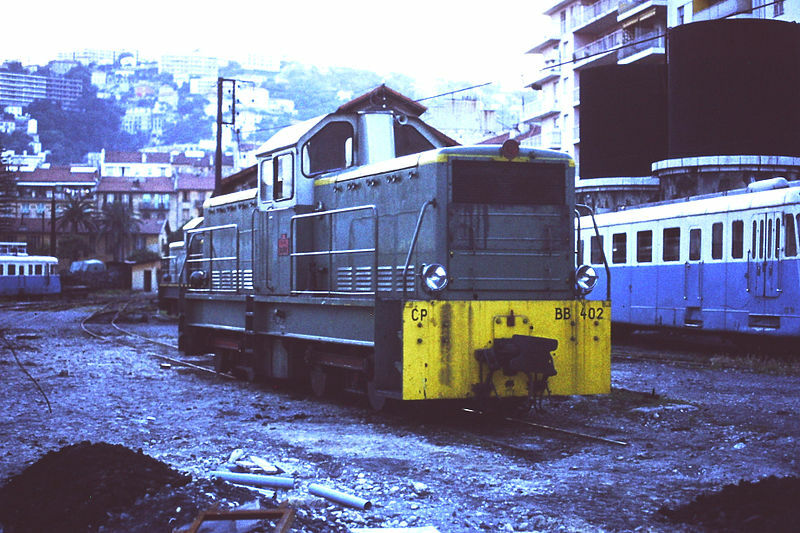 For the T62, the 1970s were devoted to lower-level tasks such as weeding, supplying ballast for the track and other materials, pushing snow plows, and so on. 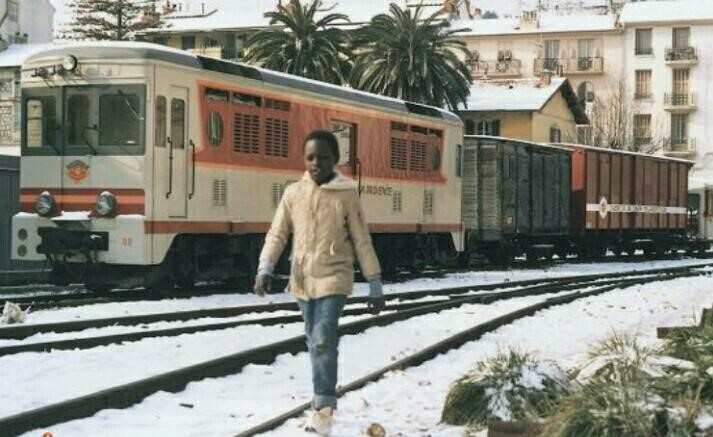 In addition to the service trains, the locomotive supported some special trains composed of cars R 1341 to 1344 (ex-AT 1 to 4), which offered enhanced capacity to the autorails. 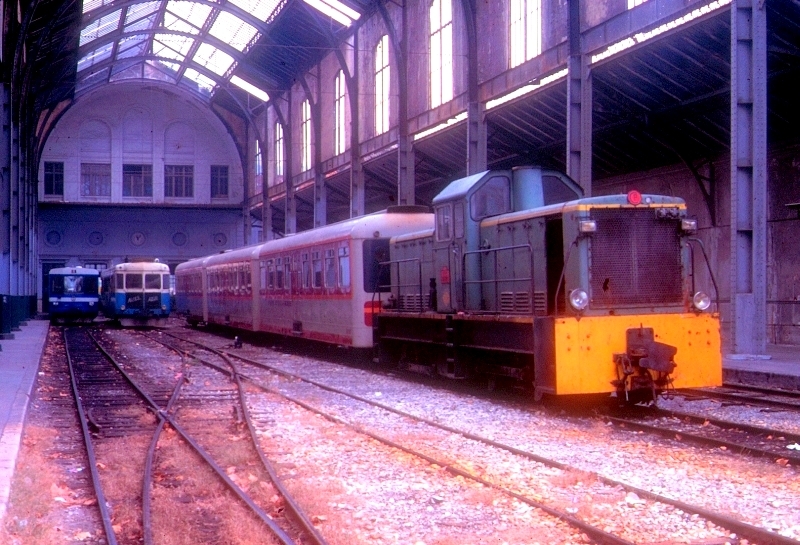 Maintenance to T62 took place in Desbrugères in the early 1980s and in 1987-88 the SNCF supplied diesel engines and electrical transmission sub-assemblies to maintain the T62. 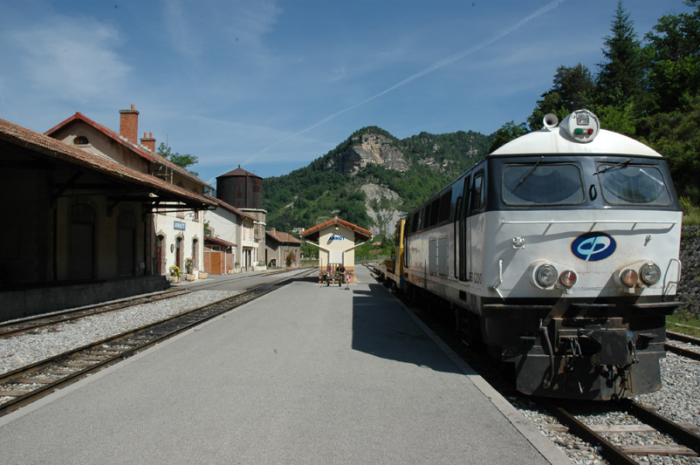 During the 1990s, the T62 remained the most obvious Brissoneau-et-Lotz locomotive on the network. Its condition deteriorated over time. In February 1999, the T62 received a running-mate. 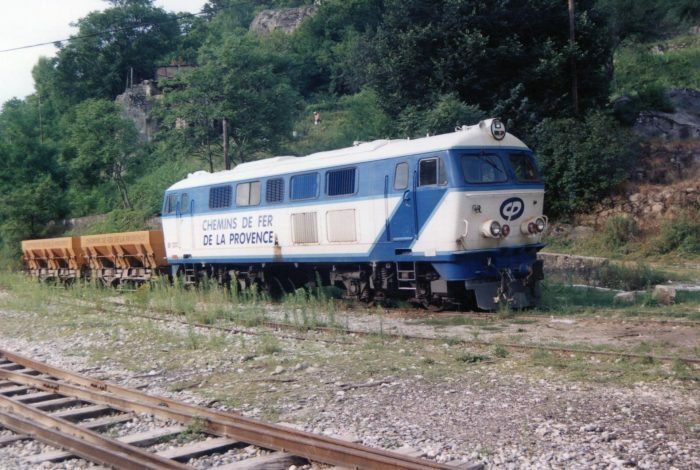 The former T1 of the VFD arrived on the network (Gm 4/4 508 of the Jura Railways) and it was numbered T66. It required some repairs after an eventful road journey from Switzerland. 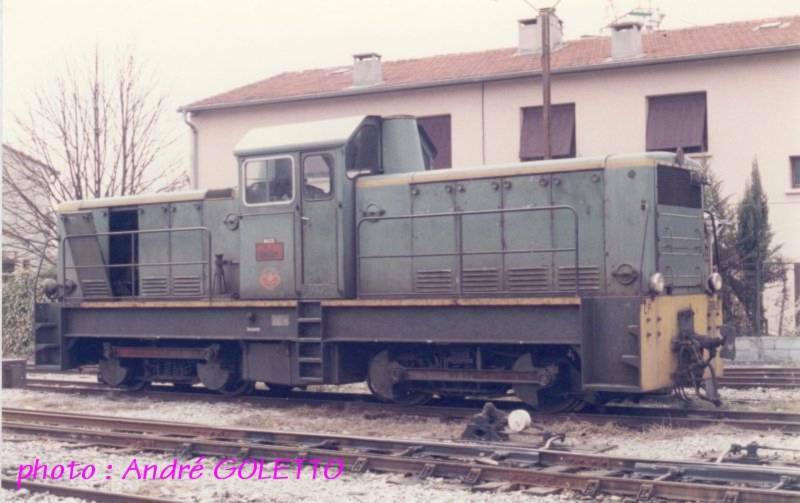 The parts needed were sourced from La Mure where the locos T2 and T4 of the VFD were stored. 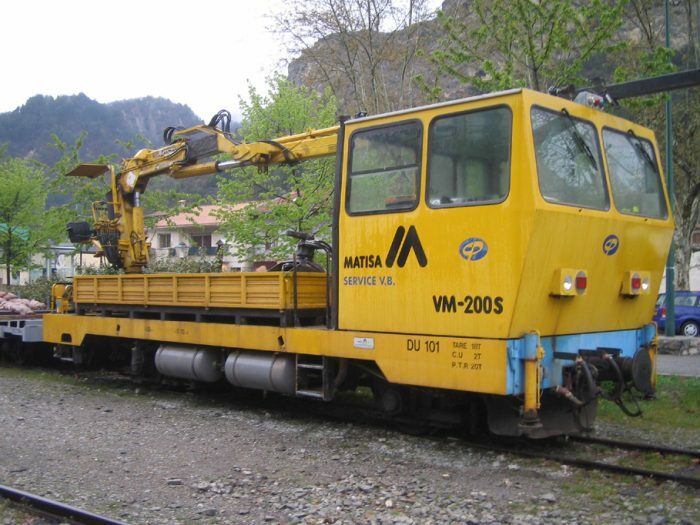 The Compania Minera de Sierra Menera (SM) ordered first three then two additional locomotives of the type DH 1200 from Henschel in Kassel. The drive unit consisted of a four-stroke Maybach-Mercedes Benz diesel engine type MB 820b with 12 cylinders in V-arrangement. It delivered 880 kW at a maximum of 1500 revolutions per minute and was equipped with turbocharger and intercooler. The cooling water was cooled in a cooling system installed under the roof. The cooling air was sucked into the side walls and blown out through the roof. A short PTO shaft transmited the torque of the diesel engine to the Voith L306r turbo transmission with hydrodynamic brake. It included three hydraulic transducers and a reversing gearbox. Two cardan shafts each drove a bogie. The two axles in the bogie are also connected by cardan shafts. The locomotives were braked with compressed air. The locomotives were designed for double traction and therefore has a skid protection device. 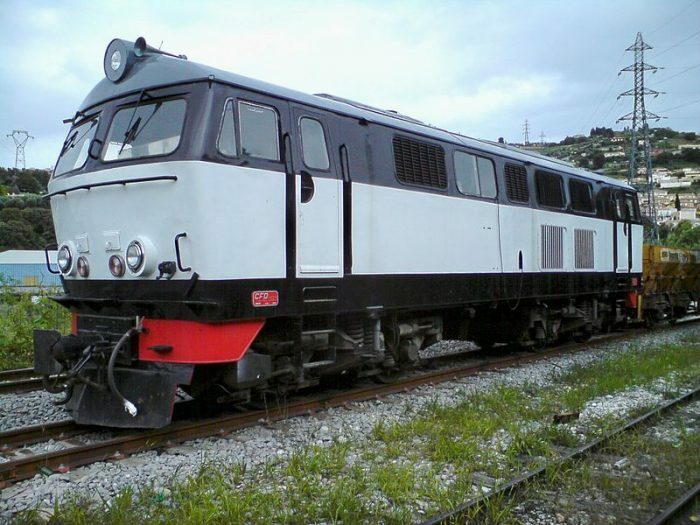 Of these 5 locomotives, Henchel BB1200 No. 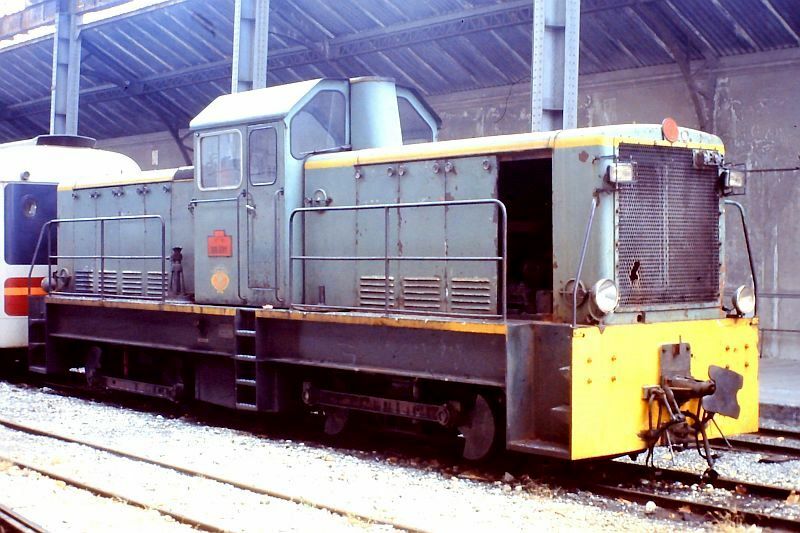 1004 with serial number 31003, built in 1966 was numbered 1404 by the Ferrocarriles de Vía Estrecha (FEVE) and noted on their roster in 1973.
https://commons.wikimedia.org/wiki/File:CP-51-d%C3%A9bris_Lingosti%C3%A8re_04-2014.jpg, accessed on 17th November 2018.
https://www.gecp-asso.fr, accessed on 10th December 2018.
https://en.wikipedia.org/wiki/Chemin_de_Fer_du_Blanc-Argent, accessed on 12th December 2018.
https://picclick.fr/Diesel-de-Provence-SNCF-Locomotive-Railway-Chemin-de-153151417340.html, acessed on 12th December 2018.
http://cccp.traindespignes.free.fr/phototheque-digne.html, accessed on 12th December 2018.
http://www.passion-metrique.net/forums/viewtopic.php?f=2&t=8154&start=120, accessed on 12th December 2018.
http://www.passion-metrique.net/forums/viewtopic.php?f=2&t=8154&start=135, accessed on 12th December 2018. Organ, John; Northern France Narrow Gauge. 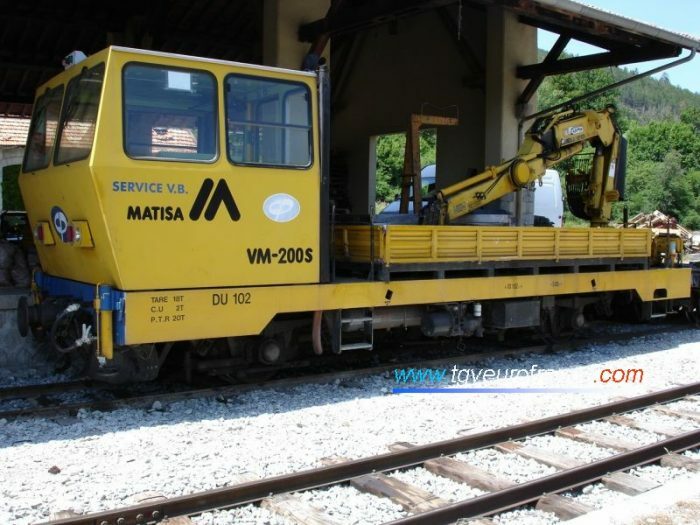 Midhurst: Middleton Press, 2002.
http://gecp.asso.fr/ba11.html, accessed on 12th December 2018.
http://train-des-pignes.over-blog.fr/article-inventaire-du-materiel-roulant-du-gecp-44929448.html, accessed on 13th December 2018.
http://cccp.traindespignes.free.fr/phototheque-materiel.html, accessed on 18th December 2018.
https://commons.wikimedia.org/wiki/File:BB401_Gare_de_la_Tinee.jpg, accessed on 18th December 2018.
https://daverowland.smugmug.com/RAILWAYS/European-Railways-1988/FRANCE-03-06-November-1989, accessed on 18th December 2018.
https://en.wikipedia.org/wiki/Chemins_de_Fer_de_Provence, accessed on 18th December 2018.
http://www.passion-metrique.net/forums/viewtopic.php?f=2&t=8552&p=406865&hilit=BB401#p406865, accessed on 18th December 2018.
http://www.passion-metrique.net/forums/viewtopic.php?f=2&t=3728&start=0, accessed on 18th December 2018.
http://metrique43.free.fr/vm_reel/vm_01.htm, accessed on 18th December 2018.
https://fr.wikipedia.org/wiki/Chemins_de_fer_de_Provence, accessed on 18th December 2018.
https://fr.wikipedia.org/wiki/Poyaud, accessed on 18th December 2018.
https://commons.wikimedia.org/wiki/File:CP_BB402-III.JPG, accessed on 18th December 2018.
http://www.bahnbilder.de/name/galerie/kategorie/frankreich~schmalspur–und-zahnradbahnen~chemin-de-fer-de-provence-cp/digitalfotografie/48.html, accessed on 18th December 2018.
http://www.passion-metrique.net/forums/viewtopic.php?f=2&t=8552&start=75, accessed on 18th December 2018.
https://en.wikipedia.org/wiki/Brissonneau_and_Lotz, accessed on 18th December 2018. 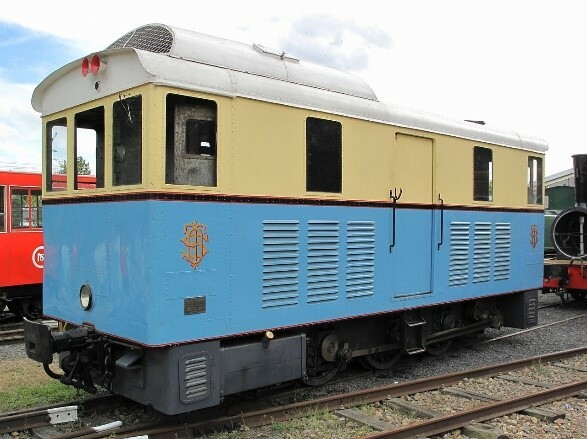 To learn more about the Trains d’ Antan see: http://passion-metrique.net/forums/viewtopic.php?f=3&t=4739&hilit=frot, accessed on 18th December 2018.
https://en.m.wikipedia.org/wiki/Simca_1000, accessed on 23rd December 2018. Voie-Libre (Loco-Revue) No. 21: October 2002, http://fr.1001mags.com/parution/voie-libre/numero-21-octobre-2002/page-38-39-texte-integral, accessed on 23rd December 2018.
https://fr.wikipedia.org/wiki/Mus%C3%A9e_des_tramways_%C3%A0_vapeur_et_des_chemins_de_fer_secondaires_fran%C3%A7ais#Mat%C3%A9riel_%C3%A9lectrique_ou_%C3%A0_moteur_%C3%A0_combustion_interne, accessed on 25th December 2018.
http://fr.1001mags.com/parution/voie-libre/numero-21-octobre-2002/page-44-45-texte-integral, accessed on 25th December 2018.
https://commons.wikimedia.org/wiki/File:CP_locomotive-Henschel-31002.JPG, accessed on 28th December 2018.
http://www.rmweb.co.uk/community/index.php?/topic/76570-railways-in-france-1980s90s-more-pics-added-012015/page-5, accessed on 28th December 2018.
http://www.le-rail.ch/text/projekt73.htm, accessed on 28th December 2018.
http://golinelli.pagesperso-orange.fr/trains/actucp.htm, accessed on 29th December 2018.
http://cccp.traindespignes.free.fr/autorails.html, accessed on 29th December 2018.
http://tgveurofrance.com.pagesperso-orange.fr/cp.htm, accessed on 29th December 2018. 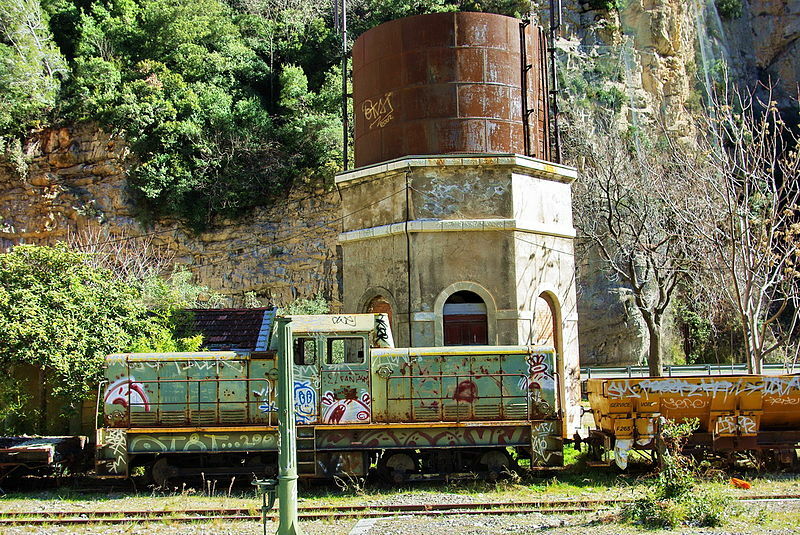 This entry was posted in Railways and Tramways Around Nice, Railways Blog on December 29, 2018 by rogerfarnworth.